Many people are now turning to interior designers when they decorate their homes, because they want to present picture perfect spaces. The living room is the center of entertainment and activity in many homes, so for many people it’s the most important room to design. There are some tips that can help you pull off the same look as an interior decorator. However, if you want to tackle the project on your own, at the very least, having a basic idea of how to approach your home decoration will help you get the final result, either on your own, or with a decorator. First off, you need to pick a general colour palette that contains multiple shades, so that you can blend and mix with your contemporary furniture. There are many different materials that your furniture can be made from, but you can narrow it down by choosing what colours you want in the room. Modern trends include mixing bright and dull shades to create subtle attractive rooms. For instance, you can do this with black and white, yellow and purple, or similar combinations. You can then use the furniture to create even more of a bang by choosing stylish upholstery or a striped sofa in matching colors, accented by rugs or carpets. Many people go overboard with photographs in the living room, but you can keep things simple by just choosing a few awesome photos and hanging them in contemporary frames that will match the furniture and the feel of the room. If you choose furniture made out of glass, leather, chrome, wood, or stainless steel then choose a similar frame that matches. This is a great way to make a photograph an expression and an accent at the same time. Finally, you may want to think about mixing a few antique pieces into your furniture design, to add a bit of charm to your otherwise contemporary furniture decor. You don’t want to overload the room with furniture, but you can use unconventional shapes to create a bold look that really enhances the feel of a room. Once again, look for bright colours and clean edges to help blend everything easily. You can also look at artistic designers for items, if you need some pieces that will stand out and help make the room unique. Sometimes you can even take an older piece of furniture and re-purpose it to make it fit your theme. Sleep is the most important part of a child’s development, but too often parents only focus on what they can get done while their child is sleeping. Instead, they should be focused on making sure that their child is getting quality sleep. One very important component of the night-time experience is the type of bed that your child sleeps in; make sure your child’s sleeping materials are the best they can be and the rest area is a safe and comforting space. 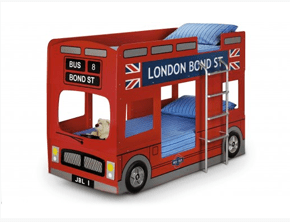 The following highlights some of the best types of beds for children. Whether you are redecorating or just matching the new needs of a growing child to a new bed, these might help you choose the perfect bed for your child. Obviously, toddler beds are marketed at the toddler age group, but many parents find that their children are able to stay in them up until age five or six. By the time your baby is a toddler you will know where they sit on the growth curve so you can probably guess whether or not this will be a good investment for you. Alternatively, you can move from the crib into a twin bed, but some children like the cozy feel of the smaller bed and it does allow for more floor space while a child is still actively playing on it. 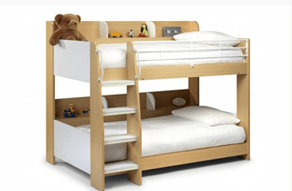 Bunk beds are a great option for children that share a bedroom because they save space and allow kids to play on the top bunk which for some reason is always charming. They are also a great choice for children that have their own room because it automatically gives them a place for their buddies to sleep when they spend the night. Plus, they make it easy for a parent or an older sibling to sleep in the room if a nightmare occurs, to offer some extra comfort. 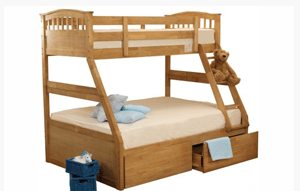 If you are looking for another space saving bed type but are not sure your children are old enough to handle the top bunk then you can look into a trundle bed. The trundle bed features a smaller bed that pulls out from under the first bed. Therefore, they are two beds stacked on top of each other essentially, but the bottom one rolls out. They are also a great space saver since you can push it in when not needed to save space. Finally, you can create loft space and the illusion of a top bunk for an only child with a loft bed. These are great for older kids because they can make cozy seats underneath the loft to relax in, and then lounge on the top when they are tired. Most have built in drawers as well allowing for more storage if necessary. Choose a loft bed with a theme if you have a younger kid and they will love you forever. After all, it’s a rare child indeed who doesn’t love a character themed bedroom. Spring is the time of year when winter finally gives way for the warmth to come back into our homes (hopefully). It’s a time for spring cleaning and as the first rays of light illuminate your home, you might wonder whether you ought to completely renovate your bedroom in favour of a design that is fresh, light, modern and new – just like spring. So let’s have a look at some of the best bedroom design ideas for spring 2015. There is no point of having only one design idea that will work for the spring alone. Many interior designers will advise on having designs that will live well past the spring season. This is where textures come in. Combine different textures against what is already present in the house. It’s just a case of playing with the colours in order to find what is perfect for you. These days, many interior designers have the idea of using glossy and lacquered surfaces everywhere. It is time to break that mould and use something new. Consider using Marble backsplash or textured 3D walls and headboards in your bedroom to break the monotony. Most people associate spring as being the time to have vivid colours and impressive designs. Sometimes trying something new can go a long way in making a difference to your bedroom. Pastel hues are back and they are revolutionising the way our homes look. What most people do not realise that pastels can be used in different parts of the house. They are mostly used in the living room, but you can introduce them into the bedroom in the form of stylish bedroom furniture. Pastel hues are all about showing sophistication, style statement and elegance. They always come in cool accent colours. Hot pink is a nice colour for spring especially, and it’s not just for the girls. It is something that evokes excitement whenever you walk into a room. The hot pink hue is a colour accent that is very popular these days. It is not the traditional soft pink, but a bold, vivid and proud colour. If you find it too overpowering, try it on one wall and contrast it with grey or brown to make a statement. The tropical theme has become quite popular in the last few years. It’s a way of interacting with nature, but inside your home. Choose some fun and funky wallpaper along with lush green palms dotted about your room. Aim for bright colours that inject some life into that tired bedroom and who knows what other life you might inject into it. These colours are all about experimenting and having fun. Whatever you go for, let spring be the season when you make the changes count! Bunk beds are ideal for when you find yourself short of space and what’s more, you can build one of your own. All you need are the right tools, knowledge and materials and you will be good to go. The first thing you have to do is to determine the amount of space you have available by carefully measuring the room. Note down measurements for both the length and width of your space. You will need several sheets of plywood, beams and wooden posts. You will also have to buy some bolts, nuts and washers. For this project, a handheld saw, screw driver, drill and hammer will be necessary. Generally, you should have a full tool kit. Cut the wood pieces according to the dimensions you measured before. A handheld saw will come in handy. You can still have the pieces sawn at a wood workshop near you. On each of the posts, drill two holes. The drill bit you use should be of the same diameter as the bolts you procured earlier. The first hole should be about ¾ inches away from the post’s end. Use the same measurement for the second hole. Create the rails where you will place the mattress beams. Measure out the rail pieces in a manner that they will fit on the bed’s breadth. You also need to place two long beams together with two short ones such that they form a triangle. Place the short rails across these two beams. Remember to leave some space apart. Nail or drive screws into them and confirm that they are firmly in place. Do the same for the other platform. This will serve the bottom or top bunker. Your bed is now ready. All it needs is mattress frames to be attached to the beams. Use bolts and nuts and screw them tight. You can always dismantle the bed when not in use. This procedure may seem to be a bit complicated for some people. In such a case, the best thing is to have your bunk bed made by a furniture shop. Take careful measurements or request the technician to come and take measurements from your house.